WORCESTER, Mass., April 11, 2019 /PRNewswire/ -- The Hanover Insurance Group, Inc. (NYSE: THG) today announced it has launched Insurago, an innovative customer-facing digital insurance platform that enables independent agents to acquire new customers. Powered by CoverWallet, Insurago enables agents to place their own personalized link on their agency website or social media channels and customers can then easily quote and issue an insurance policy through The Hanover. At the same time, the tool offers the flexibility for customers to engage their agent to answer questions and provide counsel if needed at any step along their buying process. The company initially is launching its digital platform for freelancers, independent contractors and self-employed professionals who need professional liability insurance. With well over 100 classes of business, Insurago will help agents acquire a range of new customers including consultants, IT contractors, fitness professionals, allied healthcare professionals and others. Agents will have the ability to direct these professionals to their website or social media channels to issue insurance policies through the Insurago tool. The process, from start to finish, is usually completed in less than 15 minutes. Agents' customers can view and print their policies and download insurance certificates online through the platform. Many businesses are required to provide these documents to new customers. "We continue to see an increase in the number of professionals who need specialized insurance coverages, especially with the prevalence of freelance work," said Bryan J. Salvatore, president, specialty at The Hanover. "We are excited to be able to offer our agents a tailored professional liability offering that allows them to acquire new business in an efficient way." Insurago is the latest investment in the company's robust digital strategy. The Hanover's strategy has been developed in partnership with its agents to serve customers more effectively and increase retention. The company created Insurago in response to a growing need from customers seeking a balance between a self-service digital experience and human interaction and advice when needed. "The Hanover is leveraging technology and delivering innovative products to their agents that are differentiators in the industry," said Amanjot Khaira, senior vice president of product at CoverWallet. "They are terrific partners, and we are looking forward to continuing to work with them." 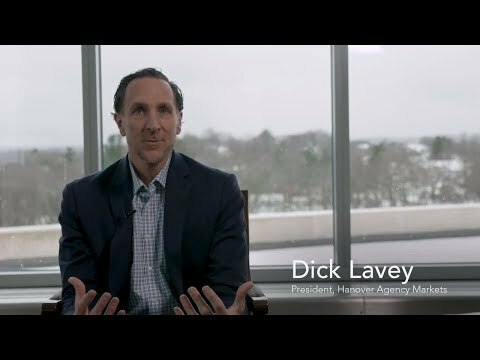 "Our agent partners play a vital role in our digital and innovation efforts as we seek ways to help them engage with their customers in a rapidly changing marketplace," said Richard W. Lavey, president, Hanover Agency Markets at The Hanover. "We believe Insurago presents the best of both worlds: a digital selling solution for a fast-growing, underserved market paired with easy access to real life agent expertise for customers who may need guidance or support. We're starting with our professional liability lines of business and in the future plan to expand into other areas of our business using the Insurago tool." Agents who are interested in using The Hanover's Insurago platform can contact their local Hanover representative for details. For more information about Insurago, please visit hanover.com/insurago and for more information about CoverWallet, please visit coverwallet.com. All products are underwritten by The Hanover Insurance Company or one of its insurance company subsidiaries or affiliates ("The Hanover"). Coverage may not be available in all jurisdictions and is subject to the company underwriting guidelines and the issued policy.